That’s me, now 73, talking with me at 52 shortly before my wife Martha was diagnosed with early onset Alzheimer’s. The year was 1997. She was 50 and our three children were still in high school and college. Martha had been active for years in local politics and civic activities and I was heading into my 15th year publishing our business magazine that covered the Tampa Bay area. I had a similar talk with myself a couple of years ago. And it feels right during this season of gifts and thanksgiving to have another one, reflecting on what I’ve learned since living with this insidious disease for 17 years. During our crisis, I didn’t understand nearly as much as I do now. Back then, I was just trying to get us through the day. Even while writing my book, A Path Revealed, I didn’t have as full a perspective as I do today: I’ve had the privilege of listening to the stories of many others. And I’ve shared our story with scores of church and support groups; with book clubs; on this blog; and been interviewed by a variety of media, including radio, TV, print, and online. Me@52: Do you remember your first reaction when hit with the news, Carlen? Me@73: Oh yeah. Our world wasn’t turned upside down; it imploded right before our eyes. I was scared and so was Martha, more than scared. We were desperate. I began to run around in circles, searching for answers as best I could, reading books, looking online, asking questions, starting a journal to store all that hit me from so many angles. There’s much better information today, but there’s still no medical solution to Alzheimer’s. Me@52: What stands out to you after all these years? Me@73: The best advice I received came from a stranger: “Carlen, be gentle on yourself.” I was on a path with few answers and many obstacles, he told me. “Some dangerous.” Be gentle on yourself sounded so easy at the time. But on more than a few occasions I can be a “perfectionist” who often gets frustrated. Martha would tell you that if she could. Yet there’s no way to be a perfect caregiver. There’s no perfect way to respond to the needs and emotions that can change so abruptly. There’s no perfect formula. Our crisis forced me to let go of my resentments as quickly as possible, to forgive Martha and myself often. Not because of some “religious” impulse, but rather to help restore our emotional wellbeing. Martha and I both learned the hard way that carrying resentments not only can hurt others but also can be self-destructive. I share more about being gentle in this short video clip by Guideposts magazine, which published a slice of our story in its December 2018 issue. As I reflect on it, I see that much of what I’m still learning grows out of this trait of gentleness. Me@52: What do you mean? Me@73: I see that my encounters with mentors during our crisis were organic rather than linear and random, as I’d previously thought. What I learned from one encounter laid the groundwork for yet another, and then that for another. And all emerged from this ground of gentleness—gentleness toward myself, toward Martha, our children, and toward those who rebuffed Martha when she acted oddly. Slowly I learned: You’ve got to step into Martha’s world now, Carlen. Stop! Look! Listen! Stop what you’re doing and be attentive. Look for the little gifts and appreciate them. Dance and sing when Martha wants to dance and sing. All so easy to say, often so hard to do. Yet vital in negotiating these 17 years. Me@52: Our visit with Sister Elaine Prevallet was significant, wasn’t it? Me@52: I remember well when she told Martha and me that we might want to look into the “difference between willfulness and willingness.” We were clueless as to what she meant. Me@73: Yes, between Martha’s political involvements and my running our magazine (or it running me)…if any activities are “willful” and headstrong, these sure are. Sr. Elaine saw something in us that we both were blind to. Even now I find myself trying to force solutions when none is obvious. But I do find it easier today to take a deep breath, step back, and relax. Sr. Elaine also suggested we “check out meditation” but didn’t elaborate. I’d read a book of Thomas Merton’s and was curious about the practice. But I didn’t know anyone—Protestant, Catholic, or otherwise—who practiced meditation. I was surprised when Lacy, the Presbyterian pastor, pointed us to a Benedictine monk named Father John Main. I ordered a set of his tapes, In the Beginning, and his book Word into Silence, and Martha and I began to meditate sitting side by side, holding hands, quietly repeating the word or mantra we’d selected. There was nothing magical about it, but over time my anxiety subsided. Martha’s, too. She acted and looked more relaxed. What did surprise me was the intimacy that unfolded between us, an unspoken intimacy that we hadn’t experienced in the 25 years of our marriage. I continue this meditative prayer practice today. Me@52: Do you still remember Sr. Elaine’s parting words to Martha and me? This insight of hers forms the very ground from which gentleness springs, something I didn’t understand at the time. Her words became the undercurrent of hope through the shifting terrain of our crisis, through all that we had to endure. We caregivers often carry a dark secret. I too often felt I was a failure. I was failing Martha, I was failing our children, and I was failing myself. The guilt that comes from this sense of failure more than anything makes us susceptible to burnout. While the latest statistics show Alzheimer’s to be growing in epidemic proportions, the burnout rate among those caring for a loved one is rampant. Be gentle on yourself, Carlen. After being charred once too often, I finally realized the need to ask for help and to accept help when it was offered. A good example is the time our sister-in-law KK encouraged Martha to join her in a water-color painting class. That changed the dynamic at home as Martha regained her confidence and became re-engaged. If you haven’t seen her art, you can see some by clicking here. Deep into writing my book, this suddenly dawned on me: All my life I’d thought of illness and disease as being a physical issue only that needed to be treated as such. Here, take this pill. Or, We need to do this surgery or that. But by living with Alzheimer’s, I became aware that illnesses and diseases are also embedded with emotional, psychological, and spiritual issues that need to be realized and dealt with as best we can. Issues like fear, guilt, stress, depression, stigma, anxiety, and long-standing resentment. You name it, Martha and I experienced it. It was important that we learn to share with our family and close friends and to connect with a good counselor or spiritual mentor. Ignoring these issues while trying to move on had done enough damage. We had to slow down and pay attention. Me@52: What else have you learned? Me@73: A lot more, but here are two things. I shared a year ago how a college buddy from Nashville, Dr. Ed Anderson, welcomed the help of his wife’s friend who organized several other friends to visit and do things with Ed’s wife, such as take walks, do lunch, and go to movies. I wish I’d discovered this concept early on. And then this: The best gift I received while caring for Martha came from our two older children after they graduated from college. Rachel and David told me they wanted to give me a weekend a month off while they watched after their Mom. I jumped at the offer, spending most of those weekends at a nearby monastery. There I could vent, read, sleep, pray, write in my journal, take walks, meditate, yell at the orange trees, and laugh and talk with the brothers who reside there. This gift was not easy on either David or Rachel as they were forced to reverse roles with their mother. Me@52: What were the biggest obstacles you faced? Me@73: There were many, but one stands out. And that was being able to see Martha’s identity and person in the midst of her diminishing skills—her inability to walk, to talk, to recognize me and the children, to feed and care for herself. All mental disabilities, including Alzheimer’s, still carry a social stigma. That’s improved some from two decades ago, but by no means has disappeared. I’m convinced today that no matter how diminished Martha’s skills were, the core of her identity—her personhood—was still intact. Too many times she connected in some fashion with us, seemingly out of the blue. Her art. Her smile. Her dancing. Her excitement when Kathryn, Rachel, or David showed up. A new online friend, retired Methodist Bishop Ken Carder, shares a similar insight in this poignant homily. Martha spent her last six years in a nursing home. I usually dropped in 5 or 6 days a week. When I did I often found her in bed or in a chair curled up in a fetal position, her right hand holding tight to the back of her neck. “Hi, Martha, this is Carlen.” Sometimes she’d recognize my voice, often not. I would sit beside her and slip my hand into her free hand, and begin to meditate as we’d practiced, quietly repeating the word we’d chosen long ago. Almost without fail, Martha would relax, her body quietly unfolding. Sometimes she fell asleep. Other times she lay awake, her bright blue eyes focused on me or on something far beyond the room. During these moments, I sensed a presence in that room that I’ve not felt before or since. It was warm, comforting, and palpable. Someone reading this may describe such moments differently than me; I can only describe these moments of mystery and stillness as God’s healing Presence. Me@52: Why did you decide to go public with our family’s very private story? Me@73: That was the furthest thing from my mind while negotiating through this crisis. But Lacy and another friend encouraged me to share our story as a way of helping others compare their issues with ours. Not long before Martha died in 2014, I cracked open the 14-volume journal I kept the first ten years; I hadn’t looked at it in a long while. “Oh…this is raw,” I remember thinking. Eventually I got past that to begin work on a draft. Only after my book came out did I realize that sharing our story proved cathartic as I wrote and cried and wondered. It helped me to grieve and laugh. If you’ve read my book—A Path Revealed: How Hope, Love, and Joy Found Us Deep in a Maze Called Alzheimer’s—you may realize that Alzheimer’s is not the focus of our story; it’s the context. The focus is the spiritual odyssey that unfolded over 17 years. I specifically describe these 17 years as an odyssey rather than a journey. After living through a volatile crisis like Alzheimer’s, the term “journey” sounds too tame and too planned to my ear. In the classical sense of an odyssey you wake up one day in a foreign country. You’re lost, you’re hurt, and you’re confused. And you’re desperate to return home. You’ll do anything to get home, you’ll go anywhere. And when you do get home—IF you do—you find home is not the same place as when you left. And you are not the same person. These hard lessons and surprising encounters are some of the reasons I decided to go public by writing A Path Revealed. Thank you for sharing your time with me. Feel free to contact me at my email address below with any questions or comments. May this season of gifts and thanksgiving be filled with wonder, with all hope, love, and joy, regardless of our circumstance or crisis. Please do yourself a favor by taking good care of yourself while caring for your loved one. PS1 One other thing: There are many good resources today for caregivers, unlike 20 years ago. Another friend in Nashville, Bob Beckett, who’s been caring for his wife for 12 years now, has compiled the most comprehensive list of resources I’ve seen so far. It’s worth checking out if you haven’t. PS2 Other lessons I’ve learned as Martha’s caregiver and from others living with Alzheimer’s and their caregivers can be found by viewing my archive of posts from the last three years. PS3 As usual, feel free to forward this post to your friends and family. If you’d like to sign up for my blog, it’s free; just click here. PS4 I recently bought 200 Alzheimer’s stamps for my holiday card mailing. The net proceeds of this 65-cent stamp go to the National Institutes of Health for Alzheimer’s research. 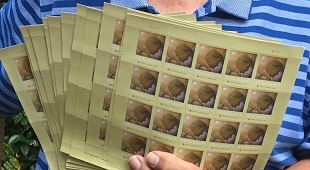 As of October, 4.8-million stamps were sold, raising $680,000 since its issue on November 30 of last year. Advocates for this stamp would like to see $1-million raised by the end of this year. Join me and thousands of others and Help Stamp Out Alzheimer’s. Older Post"Keep Asking Questions Until You Get the Answers!"